Accountability. This is probably the biggest thing holding you back from reaching your fitness goals. Holding yourself accountable is tricky. How many times have your tried something only not to follow through all the way and that gym membership ends up going unused or that DVD you bought it now collecting dust and you're no closer to reaching your goals? That's not fun! 1.) Tell Someone: share your goals and how you are going to achieve them with family, friends, etc. Just that simple thought of people asking you how's it going with achieving those goals is motivation in itself! 3.) Go Public: Post your goal on Facebook, start a blog about your weight loss journey, or keep a video diary on YouTube. As scary as this might seem, you'll be surprised by how much encouragement you'll get from others following your journey. 4.) Keep a Food Journal: this is a great way to hold yourself accountable for what you eat. It will visually show you how much you're eating each day. Share this with your spouse, coach, etc. 5.) Find a Workout Buddy: go to the gym together or do home workout programs together! If you sign up for a Spin class with your friend, you're more than likely going to show because you don't want to disappoint your buddy! 6.) 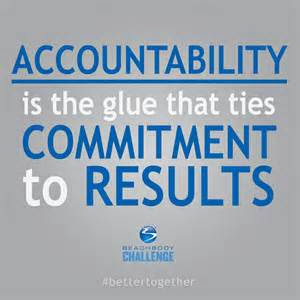 Sign up for a Challenge Group: this is the MOST perfect way to hold yourself accountable! You'll be encouraged along the way by me as your Coach and other Challengers who are experiencing the same things you are! I'd love to help you stay accountable along your fitness journey! You have to believe you can do it!